American origins in "Peter Peter pumpkin eater"
The lyrics of the "Peter Peter pumpkin eater" rhyme (unlike most) originate not in Europe, but in America. This rhyme is has become known to British children only in recent years as for most British children it has only just become clear exactly what a pumpkin is! As it is not indigenous to the British shores the vast majority of the British population have never eaten pumpkin! 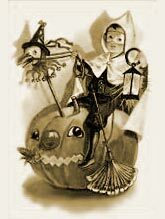 The American tradition of dressing up for Halloween (and the subsequent use of the pumpkin for making lanterns) together with 'Trick or Treat' has only reached our shores a few years ago. Had a wife and couldn't keep her!